At times we are pressed for time before the big bash and we do end up panicking to completing the entire arrangements within a short span of time. Check out the unique last minute smart decoration ideas that are quiet easy to follow to make your Daddy's Day party a complete blast altogether. Click on the link at the bottom of the page to share with others absolutely free. Please note: Elders' supervision is required for children in the decoration process. Create an elegant look with clean light pastel shades table cloth, silver ware, simple and elegant place mats for the casual look on the dining table. Complete the arrangement with fresh flowers in a soft colored vase matching the table cloth and other accessories. Play your daddies favorite music in the background. Fill in the vases or flowerpots with simple lillies and place them strategically around the highlighted room. Fix those paintings on the walls that he would love to see. Take special care with the lights in the room. They should add a soft glow to the entire ambience and accentuates the furniture decoration as well. Decorate according to your daddy's moods and nature. If Dad is a travel lover then hang out his favorite pictures of places he has visited and let him relive all the pleasure. It's also very important to keep the atmosphere fun yet chaos free. Place those interesting centerpieces on the tables that goes with Dad's attitude.E.g If Dad likes fishing then place a rubber duck in a shallow bowl. Always keep enough chairs around the dining area for extra guests to drop in.Make sure the space is not crammed. Little detailing with Daddy's favorite items would surely add that special touch to the theme of the party. Make tiny decorative cut outs with ribbons of greetings, notes or wishes saying "I love you Dad", "Dad you are Special", "Happy Father's Day" that expresses your love and affection for your Dad as surprises on his writing desk, bedside tables, lamp stands, kitchen outlets, cupboard, shoe rack and all the other areas that are frequently accessed by Dad. Invent your own ideas to place those greetings to pass the message. 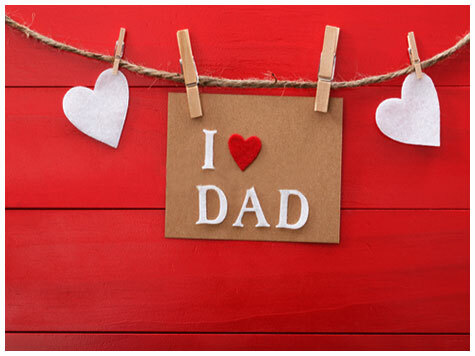 It doesn't really matter if the cut outs are printed or handwritten, as long as they contain oodles of love for Dad!! Make sure the theme of the party is chosen before the decoration is done. It is important to keep the theme in mind while decorating the party place, ambience, dinner table etc.